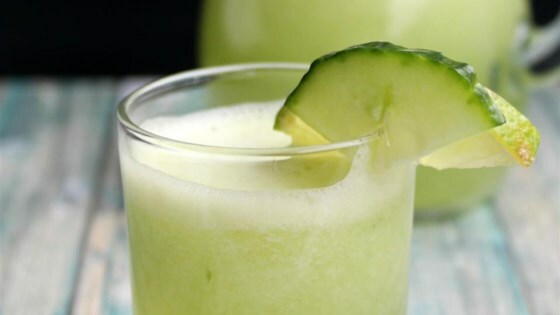 Blend 2 cups water, cucumbers, lime juice, and 2 tablespoons sweetener together in a blender until smooth. Pour into pitcher; add remaining water. Stir in additional sweetener to taste. This is my all-time favorite drink. So refreshing and so tasty. Make sure you chill it before drinking or add lots of ice. A refreshing and healthy drink. Perfect to cool down during hot summer days. You can drink it any time of the day. This is a delicious and refreshing way to up your water intake throughout the day! I really think people who aren't fond of cucumber by itself will like this. I used stevia instead of Splenda. IMO just ok. The adult kids liked it, spiked with gin. This was great! Very refreshing. I plan to make this again and again through the summer! Very refreshing. The colder, the better. Preferring tart to sweet, I left out the sweetener. I really enjoyed this. Very refreshing and a nice way to change up water a bit. Thanks for sharing your recipe, Yoly!